The 2017 North Hants Trophy finals day started at a very wet and windy Basingstoke Golf Club. Regardless, teams from Alresford, Blackmoor, North Hants and Rowlands Castle made their way to the tee for the morning semi final matches. The line up from all teams promised some exciting scratch matches and they didn’t disappoint. The first hour of play was very tough but luckily the skies brightened towards the end of the morning and conditions eased a little for the inward nine. 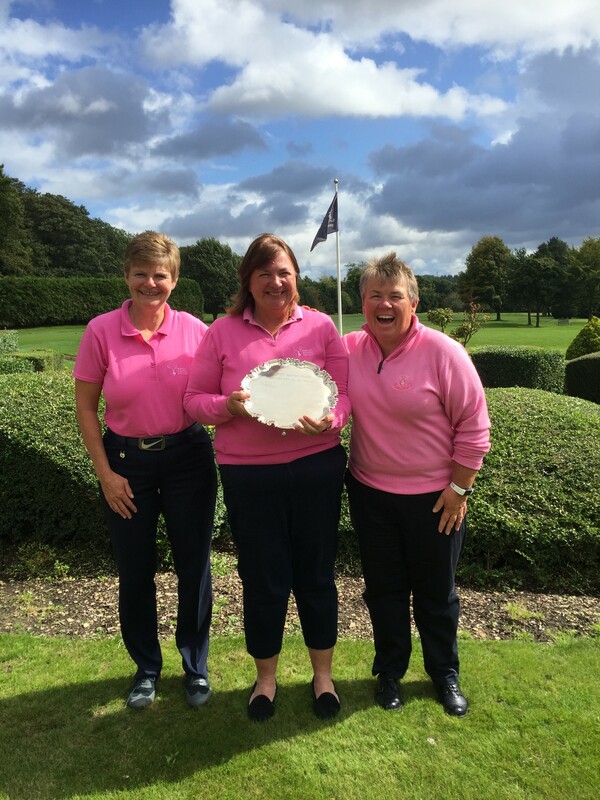 The formidable North Hants team of Jenny Kershaw, Carole Sparling and Katie Mackworth-Praed came out all guns blazing and proved to be a tough content for Rowlands Castle who were represented by Sheila Russell, Catherine Hargaden and Hampshire Vice Captain, Debbie Tapply. A 3-0 win saw North Hants comfortably through to the afternoon finals. The outcome of the other semi final match between Alresford and Blackmoor went down to the wire. In match number one, Kelly Travers from Alresford managed to secure a win against Maddie Ripiner, however the match between Jane Shergold from Blackmoor and Alresford’s Becky Scott swung the other way leaving the overall match tied 1-1. After going up early on, Esther Sparrow from Blackmoor appeared to have Alresford on the ropes but Jane Scott fought until the bitter end to secure a win on the 18th hole. At the same time, teams from Hockley and Hartley Wintney were also braving the weather to try and secure a win in the North Hants Plate final. Again, this was a close encounter with Deirdre Randall securing a win for Hartley Wintney in match one, before Chris Quinn leveled the score for Hockley. With our county President Jackie Keay, a member at Hartley Wintney and our county Captain Kay Walshe, a member at Hockley, there was some friendly banter over the radios as the final match headed towards its conclusion. Eventually it was Cheryl Scott who ensured the North Hants Plate would head to Hartley Wintney in 2017. The afternoon sky looked much less threatening and just before 1:30pm the final matches of the 2017 North Hants Trophy got underway on the par 5, 1st hole at Basingstoke. In match one, Kelly Travers took an early lead against Carole Sparling and managed to extend her lead on the front half. However, North Hants gained the advantage quickly in the second match to level the score overall. In the final match, play was nip & tuck and although North Hants had a small lead at the turn, the match between Jane Scott and Katie Mackworth-Praed looked like it might go the full distance. Out ahead, Kelly Travers managed to secure a 4&3 win for Alresford but Jane Kershaw quickly balanced the score with a 5&4 victory for North Hants. Just as in the morning match, Jane Scott had a fight on her hands to try and clinch a victory. Heavy downpours resulted in the addition and removal of waterproof layers on virtually every other hole and made putting conditions particularly tricky on the final holes. Despite a few mistakes by players on both sides, it was Katie who eventually broke the stalemate winning 4&2 and allowing the celebrations to begin for North Hants. 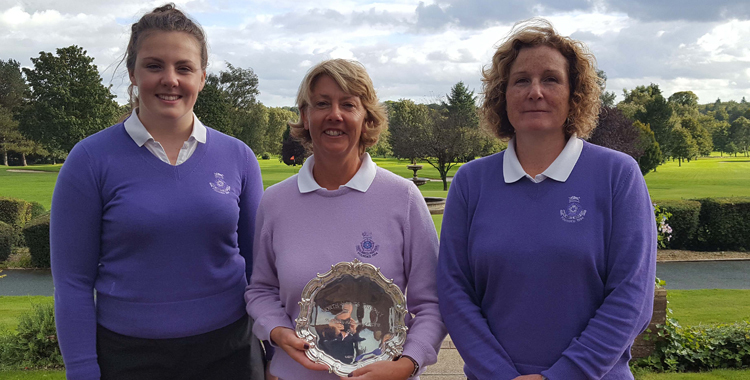 This is the first time that North Hants have won the trophy since donating it in 1987, topping off an excellent year for Jenny Kershaw who we understand won the North Hants’ Ladies Club Championships for the 20th time. Congratulations to all those who made it to finals day, there was some excellent golf on view for the many spectators who came down to support and it was an excellent day, despite the weather. 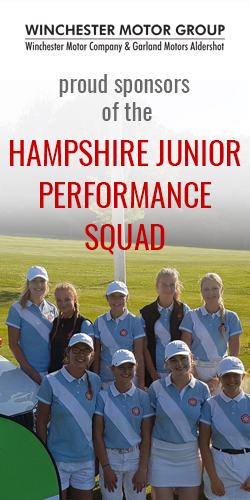 Our thanks to Basingstoke Golf Club for their hospitality throughout the day, to Jill England for all her hard work organising this year’s knockout competitions, which of course include the North Hants Trophy and to the other HLCGA volunteers that assisted on the day. For the full results tables of the North Hants Trophy and Plate please use the links on the left hand menu to be directed to the competition page.